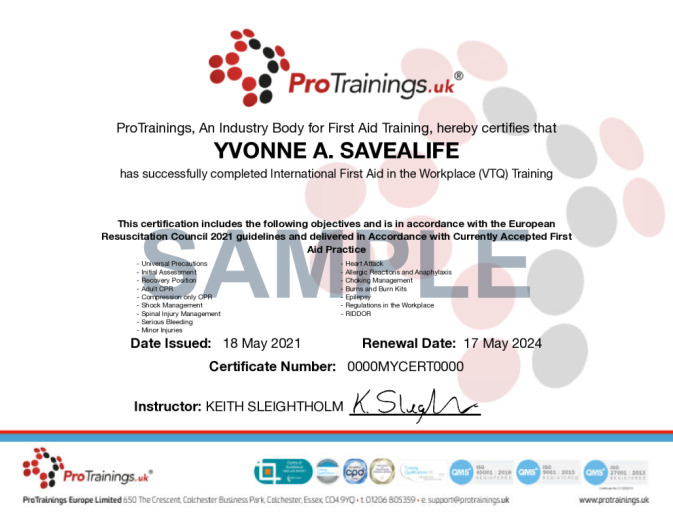 Businesses have to make correct provision for first aid in the workplace and this international first aid in the workplace course is ideal for small businesses as well as extra coverage in medium to large businesses. All our first aid courses fully meet the European Resuscitation Council Guidelines 2015. If you require a classroom a UK course please look at the First Aid in the Workplace section. This course can be completed 100% online unlike the other workplace courses as it is designed to give an employee a basic understanding of first aid requirements and basic treatments. This course comes with 4.0 hrs (5.0 class) of CPD, although the time to complete the course online may be less than this. Total course time includes 2 hours and 54 minutes of video training as well as knowledge reviews, final test, remedial help and reviewing downloaded material.